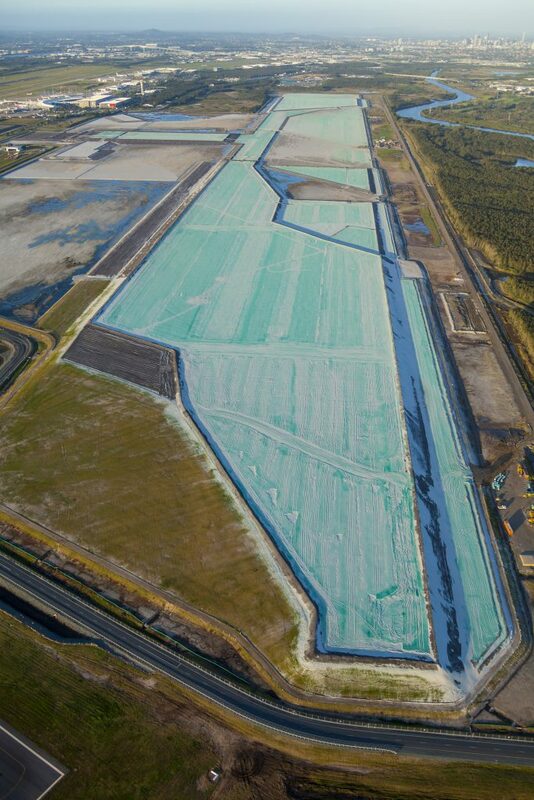 Construction of the new Brisbane airport runway involved soil wicking, turtle tickling and the movement by sea of almost 11 million m³ of sand. There are only four companies in the world that had the machinery and the experience to conduct the dredging and pumping work involved in the first phase of the Brisbane airport’s New Parallel Runway (NPR). Sand had to be vacuumed up from the depths of Moreton Bay then shipped into the Port of Brisbane and pumped through a 9 km pipeline to the runway site. The airport butts up against the mudflats of western Moreton Bay. Here, the shallow waters extend well beyond the pumping distance capability of the dredge, so the overland pipeline was the only option. Brisbane Airport with the current main runway to the left and the site of the new runway to the right. The sand needed to squeeze the moisture from the swampy soil on which the new runway will be built. The 11 m high sand construction created a 3300 m strip of solid land on a greenfield site of 360 ha, helping to form a platform on which the runway itself could be constructed. The four contractors capable of carrying out such a job were based in Belgium and Holland. 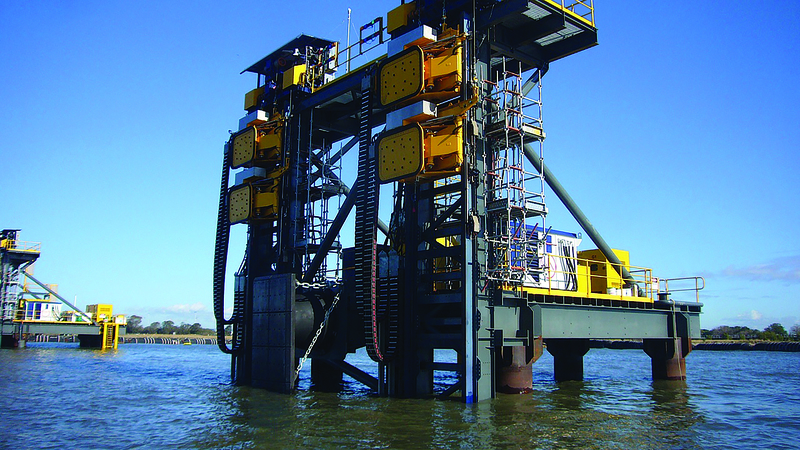 Belgian contractor Jan De Nul won the contract. 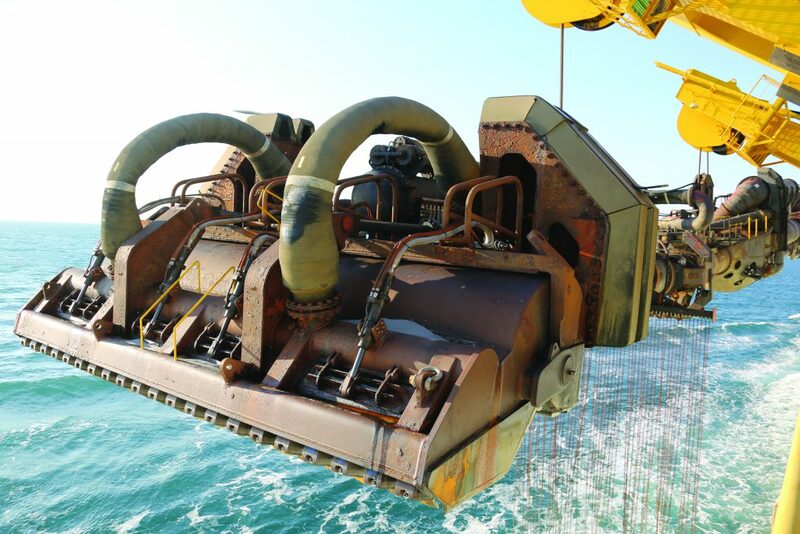 The vessel they brought in to do the job was a Jumbo Class dredge known as the Charles Darwin, and it was the first time a dredge of this magnitude had operated in these waters. The Charles Darwin is 183 m long, 40 m wide and holds up to 30,000 m³ of sand. Hydraulically pumping the sand and water mix from the mouth of the Brisbane River through a 9 km pipe was always going to be a challenge, as this distance is at the maximum limit of pumping capability, made all the more difficult by the fact that the pipe ran through Brisbane’s largest sewage treatment plant and across a live airfield. As this was the first capital city runway ever built in Australia in the new privatised airports environment, no government funding has been involved in the build. 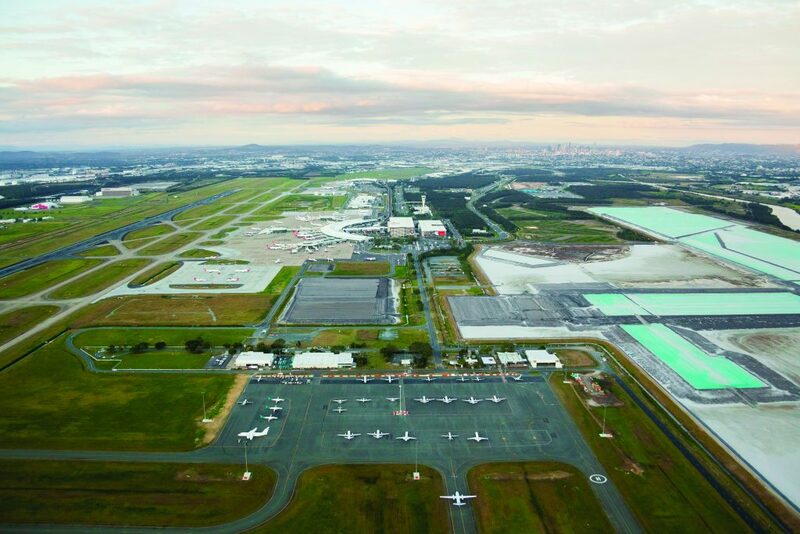 A private funding and investment model involving Brisbane Airport Corporation’s (BAC) major shareholders such as superannuation funds, the airlines and capital lenders brought together the $1.3 billion to pay for the eight-year build. The ‘turtle tickler’ encourages sea creatures to move away before dredging starts. The projected benefits to the city of Brisbane and the surrounding region are impressive. The parallel runway theoretically doubles the capacity of Brisbane Airport, facilitating up to 50 million passengers (the same as Singapore, today) by 2035. This extra capacity will deliver $5 billion per year in regional economic benefit, as well as almost 8000 jobs, by 2035. The economic argument then, was always a good one. But that is not a simple thing to explain to local communities, so BAC, and specifically NPR, put enormous effort into clear and positive communication. “Once the Terms of Reference (TOR) for the EIS were released to BAC by the Australian Government, BAC engaged more than 30 independent consultants to complete the full suite of studies required to address the TOR,” said Karyn Rains, NPR’s approvals and communications manager. The Environmental Impact Statement (EIS) essentially looked at the impacts on the ground, in the water and in the air. Vegetation clearing of the site included around 100 ha of wetland communities with the balance being a purpose planted monoculture of Casuarinas. The base for the new runway was created with sand, which places enormous weight on the soggy ground. So 330,000 vertical wicks were punched down into the alluvial channels to help water escape upwards. The area where the sand would be sourced from was proximate to high value marine environments within Moreton Bay, and finally, of course, there was the issue of new flight paths once the NPR was operational. A realistic understanding of aircraft noise and air emissions to overflown communities was vital for the public to be able to assess and make comment on the project. By late 2006, the EIS was ready for release to the public. After taking lessons from other projects around Australia, such as the dredging for the Port of Botany Bay and Port of Melbourne expansions, and Sydney Airport and its issues around curfews and numbers of flights cap, Rains and her colleagues engaged with all relevant community and government stakeholders to ensure there were “no surprises” when it came to the scope, interim and final findings of all the EIS studies. “The key aim was to bring all stakeholders on the journey of understanding of what the project was and how it would affect industry, business and the community,” Rains said. “We believed we had attempted as thorough a stakeholder engagement approach as possible,” she says. “We had planned for thousands of submissions on the EIS, but in the end we received less than 200. One of the issues identified during the EIS process was the fact that some marine creatures, particularly turtles, bury themselves in the sand in order to hide from a potential threat. When that sand is being vacuumed up by a powerful dredge, the result is not good for those creatures. So the Charles Darwin employed ‘turtle ticklers’, a curtain of heavy chains that dragged across the seabed ahead of the vacuum heads, encouraging any creatures hiding in the sands to swim away before the sand was suctioned up. The dredge footprint was also concentrated around areas of bare sand where there is typically a lack of sea life. “The southern portion of our dredge footprint had slightly higher levels of a material that can cause dredge plumes in the water,” said Ben Garnett, the NPR’s Assistant Project Manager – Construction. Another effort taken to reduce clouding of the water during the dredging processinvolved a ‘green valve’ on the Charles Darwin. In order to reduce turbulence around the discharge water being released back into the bay, the valve partly closes the discharge pipe. As a result, water gently returns, rather than blasts, back into the bay. Once the ship’s holding tanks were filled with sand, the Charles Darwin would motor, two to three times a day, into the Port of Brisbane where it would moor and begin the pumping process, mixing water from the Brisbane River into the sand to liquidise the mix before pumping it up the pipe to the airfield. The slurry ratio was originally planned for between 1:4 and 1:5 sand to water, but due to the incredible power of the onboard pumps, that ratio soon switched to 3:2 sand to water. “It is pumped as a slurry but as sand is heavier, it is always in the bottom third of the cross-section of the pipe,” says Paul Coughlan, NPR’s Project Director. “It acts like sandpaper. The rule of thumb is that the sand can wear out steel pipe at a rate of one millimetre per one million cubic metres of sand pumped. 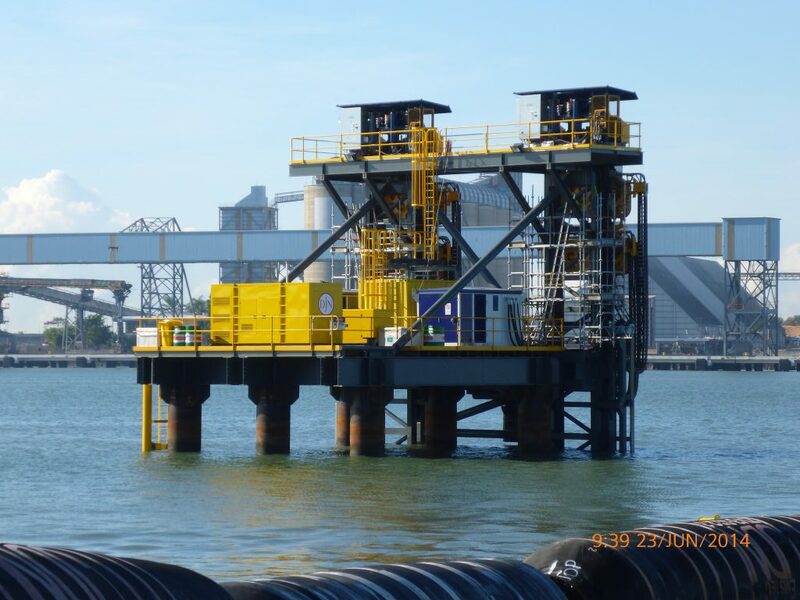 We knew we had to pump about 11 to 12 million m³, so part of the engineering requirement was for the dredger to work out how they could manage the expected wear and tear. Interestingly, the massive steel blades on the impeller pump wore out much faster than expected, but the pipes themselves did not. “The sand only ended up wearing the pipes down around four to six millimetres and nobody quite knows why,” Coughlan said. Another fascinating fact is that the slurry mixture was pumped the entire distance without a booster pump along the way. One of the captains of the Charles Darwin initially didn’t think that would be possible. The pump on board the ship boasted 15,000 kW of power, and nine kilometres is now the ultimate distance currently being achieved globally without a booster pump. The sand itself is intended to weigh down and stabilise the boggy land upon which the runway is being built. In order to cope with the unstable soft soil, the remnant of an inactive river or stream channel meandering across the site to depths of 35m, the majority of soil pore water must be extracted. The weight of the sand, combined with the capillary-tube effect of 330,000 wick drains will hasten this process and offer engineers in charge of the second phase a solid base on which to build. The sand base will take around three years to settle, but in the meantime there is plenty to go on with. The sand and wick drains are left in place to consolidate the underlying soils for up to four years, with construction to commence by 2017. The second phase involves the construction of the runway system and all necessary airfield infrastructure. It commenced in August with the Seawall and Site Access contract and in early 2017, the construction of a four-lane underpass to allow vehicular traffic to pass under the new taxiways linking the NPR to the existing terminal buildings will begin. A design weight of 710 t is required for aircraft to safely travel across the underpass. Finally in mid-2017, the airfield works begin. This includes pushing aside around 4.5 million m³ of sand, once it has done its job in settling and consolidating the ground below. The runway, measuring 3300 m by 60 m and up to 12 km of taxiway, as well as navigational aids, lighting, utilities, signage, roads, drainage and landscaping, will be constructed. The New Parallel Runway will be operational by 2020. “One of the most incredible things has been the vast array of different areas we have operated over,” Garnett said.